I didn’t really want to go to the Veteran’s Day celebration at our local high school. I always considered Veteran’s Day was for men and women who bled and sacrificed, not for some spoiled jet jockey that spent the war buzzing officer’s clubs and wearing Tom Cruise glasses. 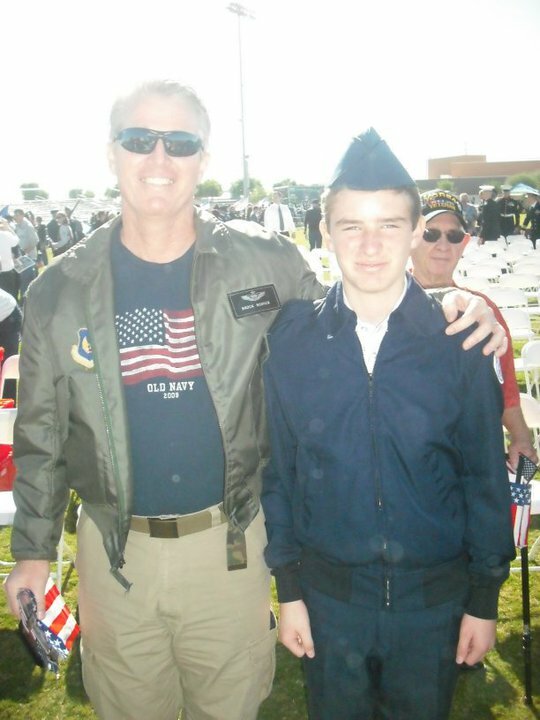 My youngest son is in AFJROTC (Air Force Junior Reserve Officer Training Corps for all you civilian types) and he insisted I attend because he was helping out with the event. So, I went. I showed up with my Ray Bans and my fighter-pilot jacket covered in multiple cool patches that would surely turn the heads of anyone important or knowledgeable. I was taken back as I strolled into the football stadium and saw the layout. The school had done the place up real nice with a large decorated stage, VIP seating, and displays from each of the armed services. They even had some civil-war cannons. I was directed to the veteran seating area at the base of the stage – it must have been the patches. I took my seat behind a bunch of old guys with VFW hats and khaki uniforms. They nodded and smiled. A guy with a Vietnam patch and a walker shuffled on to the field and sat down behind me. I remembered why I didn’t like coming to these things. I always felt guilty for all the times I complained about my cushy time in the Air Force. Grow bitter and become cynical, I thought to myself as I smiled back. “I feel out of place,” I told Paul. “All the veteran’s I saw at Veteran’s Day celebrations growing up had beards, an American-flag bandana, and rode loud Harley motorcycles.” He laughed. The program began with fanfare and they introduced the veteran’s from WWII and the Korean War by name. All the guys in front of me got introduced. Two of them had been eyewitnesses to the famous flag raising on Iwo Jima. Several of them had liberated concentration camps from the tyranny of the Nazis. A few more had been in the heat of battle on the Korean peninsula. I hid behind my Tom Cruise Ray Bans and pretended to be somebody important in the presence of heroes. You can’t have a good military-related event without three things – the colors, pyrotechnics, and speeches. This event had all three in just the right amount. The flags from each of the different branches of services were posted ceremoniously on stage one at a time. Next the Patriot Guard Riders roared into the stadium on their motorcycles with flags waving behind them. Several of them had beards and American-flag bandanas on their heads. 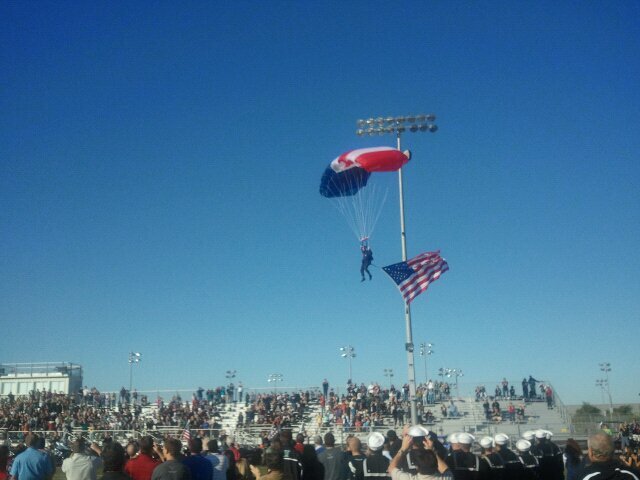 Then skydivers with the POW/MIA flag, the Arizona flag, and United States flag dropped in from overhead and nailed their target in the middle of the football field. 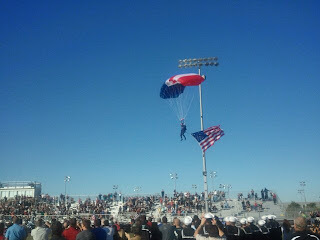 It was amazing to see Old Glory’s colors against a clear blue sky as the last skydiver came to earth. At last, the color guard formed from multiple ROTC units posted the colors to a rousing rendition of the national anthem, punctuated by fireworks. I was thankful for the dark sunglasses that hid the tears in my eyes as they beheld the majestic symbol of freedom and the rule of law. The first time the fireworks went off during the program it surprised me. I teased the city councilman sitting next to me that getting approval from the city for the pyrotechnics must have been difficult. He just grinned, and then the civil war cannons went off. I was so close I felt the shock wave from the blasts. He spoke. I think he said, “We’ll approve anything for Veterans,” but my ears were still ringing. It seemed so real I was worried that some of the other members in the audience might have flashbacks, but from the grins on everyone’s faces it was clear that all of us soldiers loved watching things blow up. Then the speeches began. I thought at first that I would end up playing with my new smart phone during some long-winded delivery of an overstated politician, but I never pulled the phone from my pocket. Each speech was short, passionate, and delivered with sincerity. From the politicians to the war heroes, the words were inspiring and reminded me why I joined the military in the first place. I was inspired once again by the greatness of the common man in our great country, or maybe I should say that I was inspired by how the common man in a country such as ours can aspire to and achieve greatness. Being a former Air Force pilot, I feel that no military celebration should be without a flyby, and I was not disappointed. Towards the end of the program, a two ship of F-16’s from Luke AFB came roaring overhead just as they fired off a series of fireworks. (Let's see Unmanned Aerospace Vehicles do that!) The cannons roared again to accentuate the roar of jet engines. I never grow tired of the sound of jet noise – the sound of freedom. 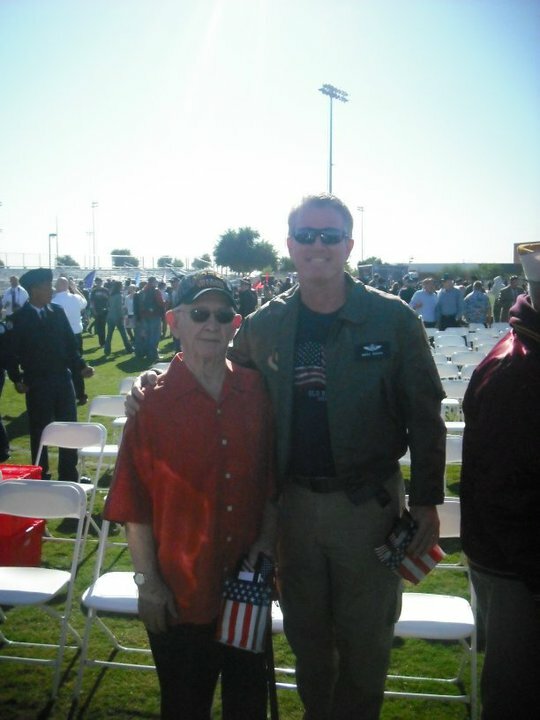 As the event wrapped up, the Principal invited the students in the stands to come down and shake veteran’s hands before returning to class. It was an unexpected treat to have those young men and women reach out to me and thank me for my service. I took the opportunity to thank them, and the other veteran’s, for inviting me to the best Veteran’s Day ceremony I had ever attended. I guess my attitude that day was similar to the attitude of most veterans when their country called them into military service. I was reluctant to go, but I went anyway, mostly out of a sense of duty. Once I got to my post, I was inspired by our flag and everything it represents. I enjoyed the red glare of rockets, and bombs bursting in air. I felt the camaraderie of my peers, no matter the era or difficulty of service. I felt sadness for those who never returned to celebrate the day with us. I was glad I had served, and I was hopeful that the rising generation would pick up freedom’s torch and carry it forward. Travel should change you. It should broaden your horizons and make you question the status quo. Your experience should leave an indelible impression that becomes a part of who you are from that point forward. I was anxious to see how my oldest son had changed after two years in the Philippines. Crossing multiple time zones shocks your system, and tosses the pieces of your daily rituals up in the air. That process allows you the opportunity to sift some of the chaff from your life, if you chose. It causes you to evaluate your habits and routines, and prepares you to accept the new surroundings as normal, even though they may be very different. Ironically, the quickest way to recover from the jet lag of crossing several time zones is to get yourself back into a routine as soon as possible. Our first full day was Sunday, so after breakfast we ventured out and went to church. I found the closest LDS chapel, got the meeting time, drew a map for the taxi driver, and headed out into the crazy Manila traffic. 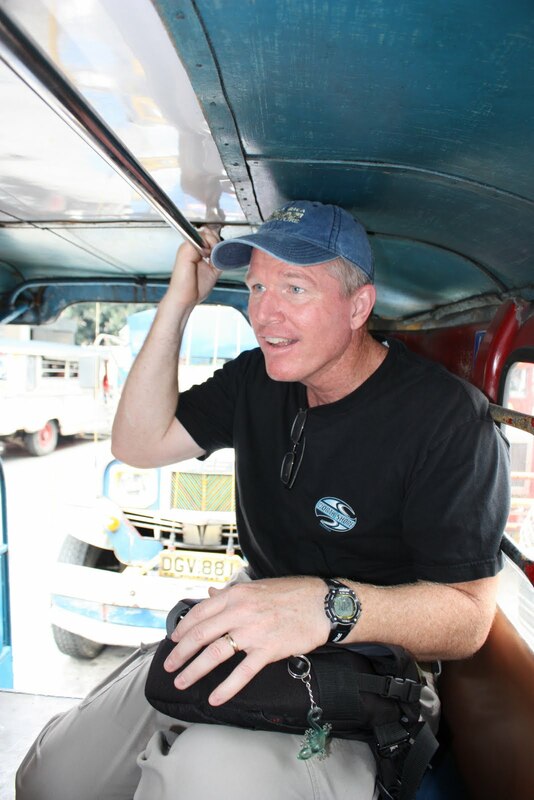 Some things are universal the world over – children, LDS church services, and taxi drivers. Children are cute and loveable. LDS Church services follow the same basic pattern of worship. Taxi drivers try to rip you off. After our first day, I could confirm the universality of those three things in the Philippines. 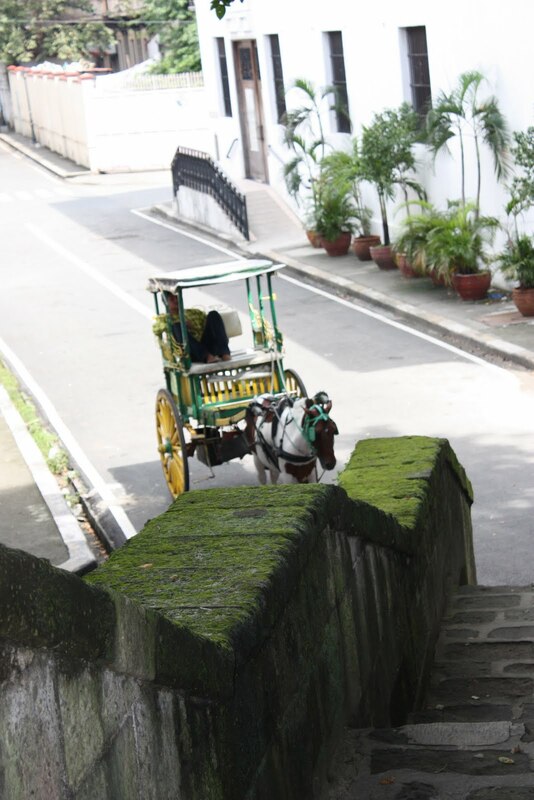 The second day we did a little sight seeing and ended up in Intramuros, the old walled city built by the Spanish in the late 1500’s. A young man, Ricardo, harassed us until we conceded to take a tour of the old city by horse-drawn cart. His horse, Indian Boy, was a flea-bitten pony that needed some groceries. I was sure we were going to lift the poor creature off the ground when we sat in the back of the cart, but he managed to haul us oversized Americans through the streets. During the tour we learned the history of the various stone buildings and the people of the Philippines. Ricardo cited dates and names with ease as he rambled on about earthquakes, typhoons, and conquering invaders. I detected a sadness in is voice as he expounded on the various battles that had left so many of his countrymen and women dead or wounded. I wondered if so many invaders had jaded the Philippinos and made them wary of visitors, but I soon had my answer. If there is a group of people in the world more courteous than Filippinos, I haven’t met them yet. Everywhere we went we were greeted by warm smiles, and friendly greetings. From the hotel staff, to the security guard at the mall, everyone was courteous. I thought at first that I would find a difference when I left the plush tourist area and headed out into the barrios where my son had served, but I found the environment to be the same. People everywhere smiled and offered a greeting as we passed. If we needed help, total strangers would offer us assistance. Even in gnarled traffic that would have brought on serious cases of road rage here in the U.S., people still applied basic courtesy. I think we could teach them a thing or two about traffic control, but they could school us on courtesy. We Americans are so lazy when it comes to learning foreign languages because we are insulated, and so many people abroad speak English. Because English is the language used in Philippine schools, most Filippinos speak basic English. I learned a few Tagalog phrases before the trip, but found that we could easily communicate in English. Tagalog flows from their mouths like a well-versed song, and their accent in English also carries a harmonic tone. I found their language pleasing to the ear. The next day, we met up with the Smiths. They are serving a volunteer mission as Humanitarian Service Coordinators for the LDS Church. They gave us the opportunity to join them in service for the day. I always believed that any money I gave to the LDS Church for humanitarian aid was used properly, but now I KNOW that it is used well, and wisely. We visited Mabuhay Deseret, a facility much like a Ronald McDonald house that services children with medical problems such as cleft palette, clubfeet, and vision problems. We then helped deliver goods to a birthing hospital where a child is born every twelve minutes. In spite of the difficult circumstances we witnessed, people were happy. I was also impressed at how little it takes to improve the lives of our fellowman. Consider donating time and money to worthy causes. You will be happier as well. Seeing our son for the first time in two years was an emotional experience, but maybe not what you think. We were overjoyed, but not the gushing uncontrolled kind of feeling. We experienced a warm embrace, and choked back a tear or two, but overall we felt a sense of pride in his growth and accomplishment. I never did feel sorry for him and his lot. In fact, I have been jealous of his experience. So, when we were reunited after such a long time, it was feeling of mutual comfort and a sense of a new beginning. I saw several changes in my son. He spoke English with a beautiful Philippine accent, and struggled to find the right words in his native English tongue. His Tagalog made Filippinos stop and gawk since he is very fair skinned with blond hair. Apart from learning the language and culture, he was not the young teenage boy that left our home two years ago. He exuded a deep-seated confidence that comes from building your life on a firm foundation. Gone was the selfish and sometimes undisciplined teenager. He had become a capable and outward-looking adult worthy of our emulation. We passed through areas of extreme poverty. If I used the word “squalor” I would be too generous. I thought of my rich blessings, and like most of us wondered why I was so blessed, and they were not. I never have an adequate answer for that question, but each time I see such disparity I count my blessings and feel compelled to be more charitable and giving. Likewise, I am reminded of how little we humans require to survive. We visited the houses of several people Rian had taught, and felt their deep sense of gratitude for our son. His love for the people was obvious. Their reciprocating love was also evident in their faces. They laughed and talked about their mutual experiences, and how their lives had been changed because of each other. We sat in their humble homes feeling grateful to them for treating our son with such affection. I was reminded of the universal goodness that is still available in a world of ever-increasing evil. As our visit ended, and I boarded the Boeing 747 bound for Tokyo and eventually Los Angeles, I felt fortunate to have visited the Philippines. I was glad I experienced first-hand the sights and sounds of such an industrious and vibrant people. Their warm and courteous spirit moved me. They say travel should change you. As I returned home after a week in the Philippines, I knew that my travel experience had accomplished its task.